Painter, Sculptor, Bulgaria and U.S.A. This diary will document the most beautiful experience of artists all around the world, that I had the luck to cooperate with in this project. At the beginning, it seemed to be nothing but just an idea. Then the little spark, step by step, gave light to those many eyes and ears, mouths, hands and hearts that deeply feel and express their many focusses on so called "done realities". And please, allow me here to say that artists are the most wonderful story-tellers the world has had and ever will have. The cooperation with the artists who will be mentioned in this book, gave both to me, great pleasure and deep experiences. Nevertheless, my first thanks have to go to Arturo Tirador, the initiator of this enormous platform 'Talent Seekers', that opens its great doors to welcome creative and peaceful communication by works of art. And all the artists, that I had the chance to get in contact with through Talent Seekers, and all those who might read this document of peace and understanding in this immense world we share and have to look after, may hopefully enjoy this little Thank-You-All, our joint "Talent Seekers' Diary". For many years, I experienced, a similarity/coincidence in the "transformation of information" or "expression of impression"
- that is to say in a multitude of artworks - of the many artists in all categories through time and space. So I made my way through the www., visited between 5000 to 8000 webpages of artists worldwide (Talent seekers seemed to be the most appropiate platform), trying to find the art works, that I felt would co-express the message of my written words. You may appreciate, that this co-expression sometimes underlines and sometimes contrasts with my text. Of course, it took its many nights to get the present result, but I have really enjoyed this cooperation with the many artists I discovered. It seemed - and still does - a warm and heartfelt cooperation and I feel proud to have them all on board my ship, that now is sailing beyond all borders. You see, this cooperation is built upon trust and honesty, respect and welcome, truth and imagination, joy and coolness, knowledge and inspiration. So in order to celebrate this extraordinary project and us, the cooperating artists, I created in addition the "Talent Seekers' Diary". expressed in HONOUR TO WHOM HONOUR IS DUE. And, yes, I admit I feel a little proud, sailing along on the high seas with this most incredible crew of artists, and I can assure you, that all those who want to come on board, are welcome. I was born in Transylvania in 1962. During my school-years, I was taught graphics and painting by some excellent artists. Later on I took private drawing lessons and was more and more attracted towards abstract works. The most valuable feature of digital art, as I see it, is the endless freedom of artistic techniques, easily allowing to alter hand-drawing with computer,- and photo manipulation. Thus, traditional and abstract elements can live together in harmony. My paintings are mostly the sensitive creations of my imagination. I keep analyzing and rearranging found and searched for motifs, my dreams, my thoughts, abstract images. These works are full of tension and emotional dynamics, with specific color and form solutions. This way, my work cannot be anything else but “me”, a piece of me, which is continuously recharging and wishing to express itself over and over again. This process carries with it the duality and succession of periods of stormful creation with periods of peacefulness. As a matter of fact, my work does not belong to any artistic category or trend. All my digital paintings have their own world and their own story. Brenda Faria lives in Brazil. Her oil paintings on wood are inspired by the Masters — rereading their works — through detailed research. More than 80 exclusive paintings have been sold around the world. Carla Campos, was born in Alhos Vedros in 1973.
scattered in private collections nationally and abroad and some retail. She participated in numerous solo and group exhibitions nationally. represented in some public and private collections. All the arts touch .... painting, poetry, music. I'm all .... all is me. Maria Cecilia Scaffo, is born in Montevideo, Uruguay the 23 of December of 1964. Of mother painter, she inherits what later it will be his great passion. Its formation in its beginnings by its mother, shares with its brothers the prettiest creative experiences. In the school already one stands out by his abilities in the drawing, showing a security in the outline and great capacity of observation. 1980 - It initiates his studies like advertising sketcher, dictated by Armand Suberbielle in BURÖ /Study of Communication. 1981 / 84 - It professionally works in Ferrero and Ricani /Publicity and 1982 in IMPETU /Advertising Organization. 1985-1987 - It definitively leaves the world of the publicity to dedicate itself completely to the painting and one registers in the E.N.B.A . National school of Beautiful Arts and later in the Factories of Jose Arditti and Juan Storm in 1987. 1990 - By their work "Snails" obtain Prize in the X Leonístico Hall Youth. 1992 - First individual exhibition makes his in Gallery "Space" where it exposes his series "Hieroglyphic" . It thus denominates them to feel them like a language of a world that is inner, spiritual, mystical. Where the objects of the unconscious one were transformed into forms and symbols. 1995 - It makes two exhibitions you synchronize in "Stroll of the Matrix" where in the first hall it exposes its series of oils "Vibrations" , where Elisa Roubaud of the newspaper "the Country" comments... The painting of Scaffo calls the attention by its colorful intoned, vibrant stop and and valued well. It composes and it structures solidamente as it could not be of another way of a good student of Storm. On this base it runs with his colors to create a world that is inner to the way of nabis, with boldness of color that sends to Fauve painters, characteristics whom they form a strong influence of the French painting and I touch vangoghianos in the circular rates of its pinceladas. Its painting is decorative and gestual she is flat, rythmical, vegetal, organic, plastic, well is conceived. 1995 - In this year it makes studies of Grafico design by computer in PCentro, where thanks to these knowledge and their permanent investigation of the education for the art, take to the creation of educative librillos for titled children " Magical Small box to it" (7 volumes) material didactic oriented to stimulate the creativity and inventiveness of the children of between 7 and 12 years. He collection "Magical Small box" this directed to the small ones, although the greater ones also can find ideas very original. Each small box contains activities in paper, fabric or wool, maderitas, cardboard or fine cardboard and a special subject on him COLOR. They are easy to do and they go step by step accompanied and of attractive drawings. 2000 - It exposes individually in the department of Maldonado in bank "COFAC" (Pirlápolis). 2002 - It along with makes the children of the Simón school Bolivar, a mural, in the walls of this school. 2003 - Individual exhibition in the "Cultural Center of the Dove" , (Rocha) where exposes its series " Dancing Objects". "We plunge into a colourful world: nature, society, existence, life, daily routine, arrangement systems. We distinguish important essential matters and situations: water, earth, fishes, goats, marine-animals, dogs, horses, human faces, horse carriages, vehicles, tables, fruits and a guitar player. It is all about motifs of the private weekday, originated out of the observance of life, of nature and of the civilisation. The abstractly curtailed and symbolically condensed picture-themes of Nùnez Valbuena reveal a deeply subjective and symbolically condensed view on the tender and life-determining particularities of the world. His works are figurative concen-trations on the essential matters that manifest themselves in this same world. Through his selective perception the artist is showing us the extrapolated incidents of life, of nature and of our being." Froy, pseudoniem van Filip Van Roy, werd in 1970 geboren te Antwerpen. Na de humaniora studeerde hij met succes communicatiebeheer. Na enkele omzwervingen doorheen Frankrijk en Spanje, waar hij onder meer aan de kost kwam als columnist, keerde hij terug naar zijn geboortestad en evolueerde hij als autodidact van proza en poëzie naar beeldende kunst. De taal heeft hij echter nooit volledig losgelaten: elk werk van hem is een ontdekkingsreis, elk schilderij een verhaal of gedicht, een zoektocht zonder einde. Verder volgde hij een doorgedreven opleiding in de digitale videokunst. De boodschap lijkt duidelijk: de creativiteit botvieren door telkens nieuwe ideeën te zoeken of oude in nieuwe vormen te gieten. Momenteel leeft en werkt Froy op Kreta, Griekenland. After finishing high school, he went on to study Communications management with high achievements. Later in life he travelled through France and Spain, where he worked as a columnist and enjoyed the local culture. After returning to his hometown he evolved as a self-taught man in the field of prosy and poetry to the field of sculpting and painting. Never completely able to let go of the written word he strives to combine his poetry in his paintings: every work of the hand of Froy is an expedition, every painting, story or poem, a search without ending or boundaries. Restless as he is he went on to specialize in the field of digital video art. The message seems clear: Giving free rein to his creativity he searches restlessly for new ideas or improves on his old Works in other forms. Lives and works in the village of Boekhoute (Assenede), Belgium. She studied Materials and Techniques in Kentfield, USA in 1992. However,she is mainly a self-taught artist. Georgette started drawing and painting when she was a child. At the age of 11, she already knew, it would be indispensable for her further life. Her work reflects her inner world; she is inspired by the phases of life, poetry, nature and music. Her paintings tell about thoughts, dreams and feelings,as well in an abstract as in a figurative way she creates a poetic mood on the canvas. 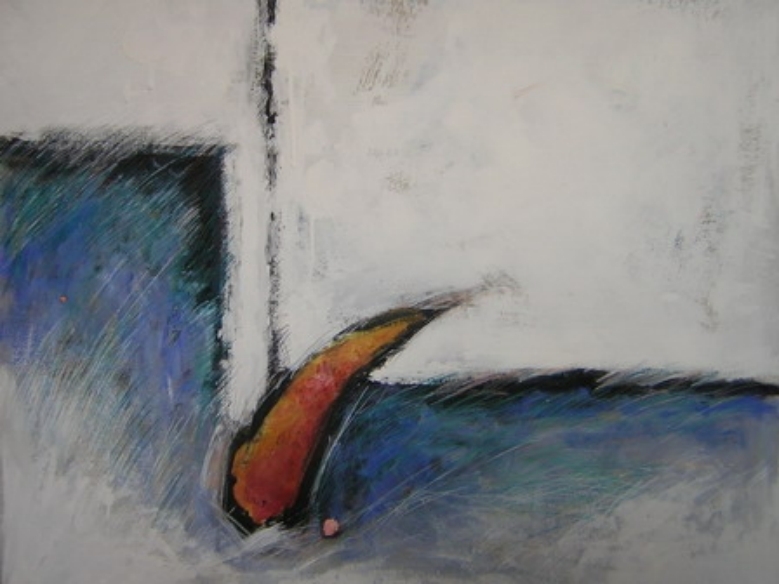 Georgette’s use of rounded shapes returns in many of her paintings. Her colourpalet differs from period to period, but is rarely hard or bright. Working with mixed media, she explores the interaction of the different materials. where the last layer covers up certain parts of the canvas, creating more depth. The materials used in her latest work are mostly acrylic paints, crayon and Indian ink, using the surface of stretched canvas or wooden panel. Occasionally she works with digital photography, and makes lamps and wooden mobiles, made from found and used objects. und nicht,dass man das Leben benutzt, um die Dinge zu gewinnen. und der Geist wird frei von jeder Last sein. und dein Herz wird nicht verwirrt sein. A prolific and critically recognized artist and musician, Gregg Simpson has exhibited his paintings, drawings, and works on paper throughout Canada, the United States, Europe, and Asia. His work is included in several academic studies, art history books and journals published in Canada, Europe, and Australia and has been exhibited in several historical surveys on surrealism and abstraction. He is also the subject of a BRAVO TV Documentary: "A New Arcadia: The Art of Gregg Simpson". The artist has received numerous grants and awards and is represented in both museum and private collections across Canada, Asia and Europe. Max Ernst, Alberto Giacometti, Wifredo Lam, Conroy Maddox, Rene Magritte, Andre Masson, Robero Matta, Joan Miro, Henry Moore, Robert Motherwell, Meret Oppenheim, Man Ray, Dorothea Tanning, Antonio Tapies, Andy Warhol, Victor Vasarely, Alfred Wols, Paul Wunderlich. Canadian: Leon Bellefleur, Jean Benoit, Paul Emile Borduas, Kittie Bruneau, Marcel Ferron, Roland Giguerre, Don Jarvis, Jock MacDonald, Guido Molinari, Alfred Pellan, Ivan Eyre, Jean Paul Riopelle, Toni Onley, William Ronald, Jack Shadbolt, Tony Urquhart, Jeff Wall, Ian Wallace, Joyce Weiland, Jack Wise, Alan Wood. Due to my work, for an airline, I have travelled around the world for the last 30 years. Being a photography passionate, my job allowed me to take photos from everywhere. Not being a professional, but just an amateur, I developed a sense of knowing and learning the distant parts of our planet, specially, the proximity to other cultures. People, customs, traditions and cultures are my maine goal, combined with the natural beauty of the earth. I do still travel a lot, but as a traveller and photographer. I love to show my views, and share my emotions throught my photos to those who love photograhy and travells. I am therefore very happy to be able now through this link to share with you my works and the take you to see the beauties of the world! Your visits and comments will be a great reward! PINTOR AUTODIDACTA. NACE EN: CIUDAD DE LA HABANA. CUBA. EL 5 DE JUNIO DE 1963. 1985- REALIZA ESTUDIOS DE ORFEBRERÍA Y TRABAJA POSTERIORMENTE COMO ORFEBRE EN EL TALLER KATEY. CIUDAD HABANA. 1987- DISEÑO DEL CATÁLOGO Y PROGRAMA DE LA EXPOSICIÓN, PRIMER ENCUENTRO DE LA CULTURA ÁRABE EN CUBA. GALERÍA EMIR ABDEL KADER. C. HABANA. CUBA. 1987- REALIZA VARIOS MURALES EN NUEVOS CÍRCULOS INFANTILES CONSTRUIDOS EN LA HABANA VIEJA. 1987- REALIZACIÓN DE UN MURAL COLECTIVO EN EL VESTÍBULO DE LA CASA DE LA CULTURA DE LA HABAN VIEJA. 1988- REALIZA CURSO DE FOTOGRAFÍA EN LA UNIÓN DE ESCRITORES Y PERIODISTAS DE CUBA. 1989-1990- CURSO DE CERÁMICA EN EL TALLER DE CERÁMICA DEL CERRO. PERTENECIENTE A INDUSTRIAS LOCALES VARIAS. 1994- REALIZA CURSO DE PRODUCTOR DE TEATRO, DANZA Y ESPECTÁCULOS MUSICALES. CERTIFICADO POR EL MINISTERIO DE CULTURA Y EL TEATRO NACIONAL DE CUBA. 1994- ILUSTRACIÓN DEL LIBRO DE POESÍA. ANAGNÓRISIS. AUTORA: LISETTE CLAVELO. EDITORIAL: CASA EDITORA ABRIL. IMPRESO: A.B.R.N. PRODUCCIONES GRÁFICAS. BUENOS AIRES. ARGENTINA. PINOS NUEVOS. EL MAESTRO ROBERTO BLANCO. TEATRO NACIONAL DE CUBA. 1995- CREADOR INDEPENDIENTE DEL FONDO DE BIENES CULTURALES DE CUBA. 1999- REALIZA SEIS CUADROS AL ÓLEO/LIENZO PARA LA PREMIACIÓN DEL EVENTO GUITA TROVA AUSPICIADO POR EL MUNICIPIO DE CULTURA DEL MUNICIPIO PLAYA. C. HABANA. CUBA. 2000-2004- REALIZACIÓN DE ATREZO ARTÍSTICO PARA INTEGRANTES DEL GRUPO CUBANO DE MÚSICA ANTIGUA “ARS LONGA. UTILIZADOS EN IMPORTANTES CONCIERTOS Y FESTIVALES EN CUBA, ITALIA Y FRANCIA. 2006- SUBASTADA UNA OBRA DEL ARTISTA EN “SUBASTAS CASTELLANA” MADRID. ESPAÑA. 2006- SUBASTADA UNA OBRA SUYA EN “SUBASTAS CASTELLANA” MADRID. ESPAÑA. 2007- SUBASTADAS DOS OBRAS SUYAS EN “SUBASTAS CASTELLANA” MADRID. ESPAÑA. 2007- SUBASTADAS CINCO OBRAS SUYAS EN “SUBASTAS CASTELLANA” MADRID. ESPAÑA. 2007- INTERVENCIÓN PERMANENTE EN EL BLOG DE arte DEL CRITICO DE arte, EL ESPAÑOL GREGORIO VIGIL-ESCALERA ALONSO. 2007- MIEMBRO DE “REPÚBLICA DEL ARTE” RepARTE QUE DIRIGE EL GALERISTA Y PROMOTOR DE arte SEÑOR VIKTOR EKIX. LA RIOJA. ESPAÑA. EXPOSICIONES PERSONALES 1991- FORMA I. GALERÍA DOMINGO RAVENET. LA LISA. C. HABANA. CUBA. 1997- PINTURA AFRO-CUBANA. CAFÉ ATENEO. MOLINA DE SEGURA. MURCIA. ESPAÑA. As well as his membership of the RBS he is a member of Artists Centre of Sweden, Artists Association in Smaland, Swedish Sculptor Union and BUS Sweden, a veritable Artistic giant having exhibited his work on such far flung places as Germany, Norway, China, Korea, Japan, Australia, Sweden, Finland, Brazil, USA and Britain where his monolithic artistry is in such demand. He somehow cathces the sheer spirituality and strength of his raw material and tranforms it mightily yet delicately. As an actor having worked by the Actor Studio method, you enter the anteroom of your unconscious. You then feed yourself with this emotional universe and you either re-sue emotions already inscribed, or you re-create emotional paths. As seeker after emotions, I have experienced the word, then the gesture of the mime; I wanted to transpose the same emotion on the canvas. I work with mineral and vegetable powders which are therefore alive and which I feed with Gregorian chants: the powders become saturated with these. To revive the colours, I have some of the paintings drying up under a wooden pyramid reproducing the Keops scale. After having performed such preliminary works, I begin my emotional search. According to the emotional scale within which I decide to work through letting go I try to reach emotional purity, just like the ultimate sound of a violin string just about to break. To be a painter brings me the privilege of not being dependent on anyone, to be alone with my canvas, the freedom of going as far as I wish, with no restriction, and with the entire intensity I long for. a vibratory impact on each of us and allow us to reset our energies. Imagine life as a system made up of multiple and infinite vibrations among which human beings act as transmitters, receptors of vibrations. All these vibrations mingle, intermingle, blend and go away: in this way we are then all linked to one another in a medley of vibrations. Our thoughts circulate. Our emotions vibrate. Imagine that positive thoughts represent the specificity of being extremely radiant and colourful; then negative thoughts would only be mist, indiscernible from one another. Observe this vision which surrounds you and allow yourself to dream. Le peintre doit être engagé, doit retrouver sa place comme guerrier, comme défenseur de la beauté de son environment. Il doit célébrer ses peuples, ses bêtes et ses paysages. Il doit dompter la cruauté et l'ignorance, tout par la transcendance du naturel, qui est son Art. Il doit chercher son inspiration dans la nature et non pas dans les tendances. tout ce que j'ai appris dans ma vie d'artiste - inutile de faire une liste ennuyeuse de mes diplômes et les façons par lesquelles j'ai gagné mon pain. his inspiration must always come from nature and not from artistic fashion. He was born in Dhaka, in 1981. In 2006, he joined Pathshala which changed his life in a new way. He graduated from Pathshala in 2009. He always wants to show a documentation of a culture with his photographs, to tell a story with his photographs with a messenger of the community. His philosophy is that it is essential for the photographer to create communication and trust with his subjects. His photographs has been published in Sunday Times Magazine, American Photo, National Geographic Society, Better Photography, Saudi Aramco World Magazine and The New Internationalist. He has been awarded as a 2008 All Roads Photography Program of National Geographic Society for his Documentary Project (Living Stone), Alexia Foundation Student Award (2009), Grand Prix winner 2009 of “Europe and Asia – Dialogue of Cultures”, Mark Grosset Documentary Prize (2009). His photographs have exhibited in Bangladesh, London, Canada, USA, Mexico, Russia and France. Photography has the visual power to educate by allowing us to enter the lives and experiences of others. Through photography, he hopes to help the society to empathize with hidden social, political and environmentally suffered people. His ongoing projects are ‘Jihad, a fighter of Disability’, ‘Living Stone’, and ‘Burning Nature, Warming Earth.’. It is important to realize that no documentation will ever be finished. This work informs his identity that has started from one point but has no ending. In my painting, I work with geometric figures arranged on different planes that overlap one another and blend into real shapes (bottles, cats, birds, fruit), fabricated objects (small origami birds and paper boats) and everyday things (hats, shoes, etc.) to create a world of mystery and sensuality. The lines I draw are devised and expressed as sensual, mystic happiness. My works are full of shapes and visual configurations that diversify, overlap and repeat to activate an imaginary world that is also real in order to create an emotional charge and an atmosphere of poetic expression. Works in which paint and air combine to create plastic expression. He begins his studies in the Baixas Academy. Mural painting school in San Cugat del Vallés, under the teacher Miquel Farré, with a scholarship from the Barcelona Provincial Council. He studies engraving at the Art College. He collaborates with the painter Ramón Vincens on the Bankisur mural in Barcelona (Chamber of Commerce). Assistant to Professor Francisco Ribera Gómez at the San Jorge Art College. 1970 Prize from Barcelona City Council for the most distinguished student of the 1969-70 academic year. Scholarship from the Rodríguez Acosta Foundation in Granada. 1971 Study scholarship in the Paluar de Segovia, silver medal from the Regional Council of Segovia. Second prize for painting in the “Premio Miguel Carbonell”, in Molins de Rey. My artwork is a reflection of my life. I have projected frozen moments - good and bad - onto the canvas. As my style and personality matured, I traveled the world. My artwork tells a story - my story - of the different periods in my personal and creative life. I was born and grewup in Bulgaria, where I obtained a Bachelor's Degree from Velico Tarnovo University of Fine Art. My free spirit, and lust for discovery and exploration fueled a worldwide journey. From Bulgaria, I moved with my family to Czechoslovakia and again to Germany in 1991. Uprooting our lives with two children proved both adventurous and challenging for me. Once we arrived in Germany, I found myself eased and inspired by many traditions, culture and good friends there. I kept painting and managed to put on a couple of shows in Germany while trying to explore different parts of Europe too. My paintings hung in galleries in Paris as well as different international shows in France. When we moved to the United States in 1994, I discovered another world-the world of electronics and computers. I became a graphic designer for a couple of years and then a clay modeler for General Motors, where I have been for the past 5 years. Here I found the opportunity to show my artwork at many national andinternational shows, where I received most recognition and awards. Today my portfolio reflects a variety of mediums and style. My paintings from Bulgaria differ greatly from what I produced in Germany or America. I spent many years as an abstract artist, but the human figure has always persisted in the creative process. Now the human expression and relationship are the leading thoughts when I take a brush or pencil. One thing I am trying to achieve is creating a work in which life and painting blend in a perfect existential poem. I will present the viewer with a harmonious, contemplative image, which speaks to the spiritual complexities of our existence. 2009 Best of Show Award in the 2009 Art Inter/National Exhibition. Nace en Lisboa, en el 70 se traslada a Madrid, donde ejerce como docente de artes plásticas. Corresponsal en Madrid “Beaux Arts European Club” de Béziers. Colaboradora de la Revista Correo del arte. Expone individualmente en: Madrid, Guadalajara, Segovia, Soria, Cantabria, Palencia (España) y en Cos, Lisboa, Guimarães y Porto (Portugal). Expone colectivamente en: Argentina, China, España, Estados Unidos, Francia, Italia, México, Portugal y República Dominicana. 2006 Instalación “Transparentes” para “La Noche en Blanco” Museo Thyssen Bornemisza. Con esta instalación inicia un ciclo de exposiciones y conferencias sobre maltrato a al mujer en diversas salas y países. Premiada en múltiples certámenes su obra se encuentra en museos y colecciones privadas de distintos países. Directora de Artes Visuales de ComuArte España. Margarita Morales was born in Mexico and today lives and works both in Berlin and Mexico-City. She studied Visual Communication and Free Art at the Academy of Art in Mexico´s capital city. Margarita considers her artistic form as being mainly abstract expressionism, although some of her work is correctly described as “Neo Pop Art”. Her outgoing personality is such that she is able to vary her artistic ability in many different directions. Just as Margarita lives in two such diverse continents, so she changes her colour scales and brushwork to suit her mood. Her art shows an enormous amount of power and originality with a strong use of colour, thereby giving her work a uniqueness all of its own. Margarita Morales, gebürtige Mexikanerin, lebt und arbeitet in Berlin und Mexiko. Sie studierte Visuelle Kommunikation und Freie Kunst an der Kunstakademie in Mexiko-Stadt. Ihren Stil bezeichnet sie als abstrakten Expressionismus. Aber als eine vielseitige Malerin sind ihre figurativen Abstraktionen mit „Neo Pop Art“ auch immer richtig benannt. Es ist ihr Persönlichkeitsmerkmal in viele Richtungen zu gehen, für alles offen zu sein. Wie sie in zwei so verschiedenen Kontinenten lebt, so wechselt sie auch immer wieder ihre Farbskalen und ihre Pinselführung. In alle ihre Werke bringt sie ungebrochene und ungebändigte Kraft ein, die ihre Bilder ursprünglich und einzigartig erscheinen lassen. Nomadism very early marks the course of this Haitian artist who at the age of three leaves with her family, her native land., Haiti. Fleeing the Duvalier regime of Papa Doc. and his fearsome Tontons Macoutes *, in 1964 her parents exile themselves towards North Africa and settles in the town of Medea, in Algeria, with their three children. In 1966, the family crosses the Moroccan border and the Douyon establish themselves in Casablanca where they will remain for the next fifteen years. The childhood and the privileged adolescence of the youngest child Marie-Denise run out peacefully paced with summer vacations across the Gibraltar Detroit in Spain. Her childhood years embrace the throbbing accents of the oriental culture and Marie-Denise will grow up sharing part of her Moroccan universe, being educated in French schools and embedded of her family Haitian culture. These three cultural flavors which intermingle in her daily youth will develop in this future artist a keen taste for diversity and interculturalism. Upon completing her secondary courses, Marie-Denise Douyon chooses to pursue her studies at the Fashion Institute of Technology of New York where she graduates with honors in visual arts. When the Duvalier Regime collapses in 1986, she joins her mother and sister, recently established in Port au Prince and discovers a land overwhelmed with faith and euphoria. Since she immigrated to Montreal in 1991, her artwork has translated an identity rooted both in her country of origin and her adopted country. *Papa Doc and his Tontons Macoutes : Francois Duvalier president and dictator of the Duvalier Regime was in power from 1957 to 1971. He establishes the fearsome parallel force the tontons macoutes. In June 1964, he proclaims himself president for life and designates his sun Jean Claude as his successor before dying in 1971.
è nato ad Ancona il 15 Dicembre del 1962. Vive e lavora a Sirolo (AN). Si è diplomato presso il Centro Sperimentale di Design CNIPA di Ancona, con la qualifica di Progettista d'Immagine (Grafica, fotografica, audiovisiva), con una tesi su animazione e disegni animati. Maurizio Baccanti è essenzialmente pittore autodidatta, fortemente attratto da artisti come: Vedova, Burri, Pollock e Herbert Pagani.La sua attività pittorica ha inizio, in modo continuativo e deciso, a Perugia nel 1985,durante lo svolgimento del servizio civile sostitutivo a quello militare presso una casa albergo per anziani, periodo questo che lo segna profondamente. Dal 1985 ad oggi ha partecipato, per propria scelta, soltanto a mostre collettive ed è apparso al pubblico con la sua prima personale all'Atelier dell'Arco Amoroso di Ancona, nel 1997, con i lavori del filone espressivo "EVOLUZIONE". Negli ultimi suoi lavori, riconducibili ad un nuovo filone espressivo: "NATURA & ARTIFICIO", evidenzia il rapporto distruttivo che esiste tra l''uomo, che si pone come artefice del nuovo, e la natura che cerca con tutte le sue forze di alienare la dimensione dominante dell'artificio su di essa. Natura e Artificio comprende una serie di sculture bi/tridimensionali assemblate e realizzate con materiali di recupero, tutti rigorosamente recuperati lungo la spiaggia e la foce di fiumi. Non "IMMONDIZIA" ma "RELITTI", "TESTIMONI" che questa società consumistica abbandona e la natura trasforma ma non riesce a distruggere. Maurizio Baccanti, professionalmente svolge l'attività di Guida Ambientale Escursionistica che lo porta a contatto costante con l'ambiente naturale. Il suo vivere quotidiano, in cui alterna periodi di vita "urbana" a periodi di vita più "naturale", è alla base del nuovo filone espressivo "Natura e Artificio", dove questo passaggio continuo tra "CITTA'/CONSUMI" e "NATURA/ESSENZIALE", diventa per l'artista la molla scatenante per la produzione dei suoi Assemblaggi. Alla sua professione lega anche la passione della fotografia naturalistica e della "FotograFFia" (rielaborazioni artistiche su materiale fotosensibile), grazie alla quale ha già realizzato numerose dia-proiezioni. Ammassi… oggetti… semplici “cose”, usate, consumate e rifiutate …. Rifiutate da una società che tutto ingurgita e tutto rigurgita in un continuo e incessante ingranaggio che tutto vuole schiacciare, sotterrare, soffocare. stessa anima che prende vita sotto il calore delle proprie mani; sotto un impulso cieco e quasi frenetico … tutto prende forma. ciò che non siamo più capaci di vedere e ci svela in una sorta di metafora, l'immagine dello specchio del tempo, il nostro…..
Mónica Ardaiz Petro nace nace en Cutral-Có Provincia de Neuquén, Patagonia Argentina. En su adolescencia se traslada a la Ciudad de Neuquén para ingresar a la Universidad Nacional Del Comahue, donde finaliza sus estudios de Lic. en Servicio Social. Ya ejerciendo su profesión se inicia en el arte estudiando dibujo y pintura, experimentando con distintas técnicas y realizando muestras colectivas. En el 2003 se instala en la Ciudad de Buenos Aires y continúa sus estudios, dejando lo figurativo para incursionar en el campo de lo abstracto. Desde el año 2005 trabaja en los talleres de Pintura e Investigación Plástica de los maestros Zorrilla-Distefano y paralelamente, a fines del año 2006, también participa en el taller del Maestro Surrealista Jorge Kleiman. A partir del 2008 incursiona en el Collage y Tècnicas Mixtas en el taller de Silvia Flichman y ese mismo año se diploma en Gestoría y Produccción Cultural. Poseen sus obras colecciones privadas de España, Costa Rica, Irlanda, Israel, Estados Unidos y Argentina. • Primer Premio Salòn Otoño Galeria R.Van R - Abril 2008 - San Telmo, Buenos Aires. • Seleccionada Concurso Nacional "Arte en el Abasto" - Enero 2008 - Buenos Aires. • Seleccionada Concurso Nacional XI Aniversario Palacio de las Artes - Junio 2007, Buenos Aires. • Segundo Premio V Salón Aniversario - Galería Desde la Plástica – Mayo /2007, Buenos Aires. • Seleccionada III Salón Primavera - Galería Desde la Plástica – Octubre 2006, Buenos Aires. • Gran Premio de Honor en Pintura VII Salón Primavera - Galería de las Naciones. – Septiembre 2006, Bs. As. • Mención en Salón Primavera - Galería Arte Braque - Septiembre 2006, Buenos Aires. • Encuentro Manchas de Otoño en la Recova de Posada, integrada a circuito Gallery Nights. Mayo 2006. Bs. Aires. Nazim Mehmet has solo and group exhibitions in Azerbaijan, Turkey, Russia, USA, France and Germany. Artist has many works in private collections in Azerbaijan, Turkey, Russia, Denmark, Switzerland, Germany, Israel, Italy, Litvania, Latonia, India, Japan, Dubai and Ukraine. Nazım Mehmet who has an academic art education always mentions his admiration to Renaissance Art. However, it was Paul Eluard’s poems he was fascinated by and became the main source for his paintings. Paul Eluard was one of the announcers of Surrealist manifest. Being affected by the surrealist artists such as De Chrico, Dali and Matta, Mehmet adopts the surrealist principle of scrutinizing and leaving free the creative subconscious. Intensifying his work around this principle, artist takes the subconscious dream images and makes them to exist isochronally as they are in a dream letting them to spread on the surface without any judgment. Mehmet has a fantastic style which he presents unrelated objects in an aura. It is not predictable to see impossible objects in his paintings as we see in the paintings of Dali. On the contrary, he chooses objects from daily life that we are familiar with but a relationship can not be interpreted between them. Such as a lobster, a key, a pomegranate, a sword, a pigeon or a sundial are being presented as they are creatures of a fantastic world. What we see in his paintings is daily objects are described in a manner that they reflect such a reality that does not belong to this world. In the works of Mehmet whose aim is to present a world which is surrealist, dreamlike and out of mind, human figures give the sense of being belonged to this world at first sight. However, we realize that they are related to another world when we see the figures raising from the ground with shining aureoles over their head. We can never see faces of human figures; either their faces are hidden behind a cover or their back is turned us. This is another aspect increasing the mystery and intensifying the sense of them being belonged to another world. Time to time, these figures appear to be winged angels surrounded by a spiritual light. Book, birds and sundial are the common objects Mehmet uses almost in all works. Book is the symbol for wisdom as well as justice; birds are the symbols of freedom; sundial indicates the life time passing by. It is observed, artist mostly spreads the objects over the rocks in a surrealist surroundings. Rocks and stones are the important issues in his works. According to him “stones and rocks have their own stories and experiences with in themselves. They are witnesses to the places where they sit and they are embedded with the memory of that place and layered with its history”. Silence dominates the world of Mehmet. Neither pain nor happiness is not the part of his world. Everything is like flowing in a silent eternity, and in that sense pectoral meaning of silence indicates metaphysical meaning. The gates suddenly appearing in the middle of the painting becomes evident as the passageway to a different metaphysical world and to the other dimensions. Mehmet opens out the doors towards the new creativities peculiar to his style with the surrealist world he creates in his paintings. The Russian painter Olga Kalashnikova was born in Moscow. As a child she used to spending her summer holidays in Pereslavl-Zalessky, an old Russian town to the north-west of Moscow. The painter’s mother was born here. The region is known for its endless dense forests and clear waters of the river Veksa. Olga’s esthetical passions were formed in this region. Olga’s father was a well known painter. He could not spend a day without his sketch pad and paints. His daughter inherited the tradition. Her route to painting was not straight forward. After school she chose a career of a ... mathematician. She studied Applied Mathematics at the Moscow Aviation Institute. After graduating in 1977 started research into the algorithms for cruise missiles. But Olga’s love for painting did not vanish. Every evening after work Olga started attending art classes to learn more about her real passion in life. Soon, she left her profession of mathematician and went to the Moscow Academy of Art. In 1988 she graduated at the top of her class. Then she worked in an Art College teaching drawing and painting. Years of painstaking work, thoughtful and exigent attitude for her creations allowed the painter not only to perceive the figurative language of fine art, but to find her own way to express herself in art. Olga became a member of the Russian Assiciation of Painters, which is an honor for a painter in Russia. Russian nature and Russian life became the main themes of her paintings. Her canvases are full of light and poetic harmony. She tries to establish a direct link between the painter and viewers. This task makes her think about visual methods of art. The painter is sure that art should depict reality, not just give us indications by hints or rebuses. Olga Kalashnikova is always concerned about painter’s responsibility. From her point of view, a painted picture has a life of it's own and thus affects the viewers. If a painter deforms the beauty of God’s created world, voluntary or not, he spreads a deformed understanding of life. That’s why Olga tries to choose subjects which are particularly beautiful. Nowadays many artists want to paint differently from the ‘old school’, but she really enjoys following the old realist tradition, which appeared in Russia in the XIX century. She learned from them how to feel and paint. They were her teachers. A new phase in Olga's painting carrier started in 1997 when Olga began to work on a theme that perhaps is a little unusual for a woman – the military campaign of famous Russian general Alexander Suvorov who led Russian army through the Alps in 1799 to fight French army. Despite the fact that Olga was not a painter of battle-pieces, she decided to show in a simple, precise and honest way Swiss and Russian soldiers who fought and died there. She wanted to show paths, bridges and and villages the Russian heroes passed by during the military campaign, as well as the cemeteries where perished Russian soldiers had been buried. She wanted to show the feeling of the Russian soldiers, who came to the Swiss mountains from a flat country. Olga has had three one-artist exhibitions in Switzerland of her paintings. As lyrical realist, her focus is on Russian nature and everyday life. Her canvases are full of light and poetical harmony. Olga’s paintings are like an open door from the noise of the capital city to a borderless homeland where you can hear church bells at sunrise and sunset, where there are living, joyful and suffering human beings. One of Olga’s art admirers left a comment on Olga's web-site: "you have a talent so heartfelt, colourful and spacious. Let God send you a good health and work. What else can I wish to a creator of joy?". In November 2006 Olga Kalashnikova brought an exchibition "Three Generations" to the United States to a russian gallery in North Caroline. Americans warmly greeted Olga's works, as well as works of her farther Victor Egorov and her son Egor Kalashnikov. Olga conducted a number of master-classes. Next visit in March 2008 brought back old friends as well as new admirers. Olga Kalashnikova is a member of the Artists Association of Russia. She is a participant of the Moscow, republican and group exhibitions. Personal exhibitions also took place in 1996, 1997, 1999, 2000, 2002, 2006, 2008 (Moscow, the White House - Russian parliament Duma, The Unites Sates etc). Olga's works are in private collections and galleries in Russia, Austria, England, China, Switzerland, Germany, Spain, Japan, USA and in other countries. Nasce ad Esfahan nel 1977. Inizia a disegnare a soli tre anni. Da suo nonno apprende la passione e la tecnica per il disegno, è il suo primo maestro. In giovane età impara la pittura figurativa, si cimenta in ritratti e nature morte. Notato il precoce talento, i genitori lo affidano agli insegnamenti del maestro di disegno Ustad Davati. Nel 1987 dipinge il suo primo quadro naturalista ad olio, sotto la guida del suo nuovo maestro Ustad Nasr, famoso ad Esfahan per essere stato uno dei primi ad usare la tecnica figurativa realista per ritrarre la natura, usando la tecnica ad olio. Durante l’adolescenza continua a dipingere ad olio adottando soggetti sempre più complessi come ritrarre le complicate architetture della sua città. A soli 17 anni diventa maestro di pittura presso la scuola del nonno. A 18 anni con la tecnica figurativa realista ha raggiunto livelli altissimi, ma arriva ad un punto in cui non riesce più a completare i suoi quadri, non trova più soddisfazione in quel tipo di pittura, è in questo momento che si avvicina alla musica e vi si appassiona. Inizia a studiare la musica tradizionale dell’Iran e il setar (strumento a corde tradizionale persiano), con un giovane ed ispirato maestro che lo conduce in un nuovo mondo che gli dona le soddisfazioni che la pittura non gli dava più. Ma in questi anni non abbandona del tutto la pittura, continua ad insegnare presso la scuola del nonno, senza però dipingere. Nel 1994 prende il diploma di maturità e nello stesso periodo inizia la lettura di vecchi libri d’arte moderna del nonno. Nello stesso anno si iscrive all’ Università, presso la facoltà di Ingegneria, ma continua a suonare e a leggere avidamente libri di filosofia e storia dell’arte. Improvvisamente torna in lui l’impeto di dipingere, ma non come aveva fatto per tanti anni, ma ricercando lo spirito che aveva trovato nella musica, la stessa libertà, vuole dipingere la musica e le sue canzoni trasformarle in quadri. In quel periodo riprende lezioni di pittura presso il maestro Akbar Mikhak, che per 30 anni aveva vissuto e studiato in Italia presso l’Accademia di Belle Arti di Roma, e poi era tornato ad Esfahan. Passavano ore ed ore a parlare, grazie a lui comprende che cosa è la pittura. Determinanti per la sua svolta artistica sono inoltre le letture su Marcel Duchamp, passa le sue giornate a dipingere freneticamente studiando gli stili e i materiali più diversi e invece che abbandonare la pittura, la scoperta di Duchamp lo spinge a dipingere sempre di più. Ciò che ritrova è la passione e una nuova ispirazione: la voglia di dipingere il rapporto tra la musica e la pittura che sono dentro di lui, l’ispirazione è la musica tradizionale persiana e la ricerca continua del colore dei suoni e degli strumenti antichi persiani. Nel 2003, dopo alcune mostre personali e collettive nella sua città, lascia il suo paese e si trasferisce in Italia, inseguendo il suo sogno d’infanzia: studiare arte a Firenze. Si iscrive presso l’Accademia di Belle Arti di Firenze e studia con il Prof. Andrea Granchi docente di pittura. Partecipa ad alcune mostre collettive in Italia. Attualmente vive e studia presso l’Accademia di Belle Arti di Roma. La forma (spesso cruda e tagliente) che prende vita sulla tela rappresenta la voce dello strumento, il colore diventa il simbolo del suono, la sua voce e il gesto da cui è scaturito. La materia ( come lo stucco, il cemento, l'acrilico, il pastello...) è al servizio della voce dello strumento, del gesto e dell' impeto del tocco del musicista. Il colore simboleggia la semplicità manifatturiale degli strumenti orientali, l’imperfezione della loro voce (rispetto gli strumenti occidentali come ad esempio il pianoforte) è mistica, perché più vicina all’imperfezione dell’uomo, spesso questa semplicità è rappresentata attraverso l’uso del colore bianco. Negli ultimi quadri la forma tagliente diventa ancora più semplificata, più astratta, prevalgono, sui colori, la matita e la materia, come lo stucco, che pone in rilievo sulla tela, giocando con le luci e le ombre che esso genera. In altri quadri lavora sulla nitida immagine degli antichi strumenti iraniani, o sui particolari di questi; consegnandoli ad un contesto astratto, diventano anch’essi astratti. Percettivamente le forme si definiscono e si cancellano proponendo un percorso mimetico all’osservatore, rappresentazione e presentazione coesistono nello spazio. Il risultato e’ quello di ottenere una sorta di percezione retinale dilatata attraverso un gioco mimetico. E’ nel 1996 che inizia a dipingere nonostante la sua passione per l’arte inizi molto prima, essendo nipote di Vittorio Trainini. has been active as an artist in the professional field since 1994. His main styles are surrealism and magic realism. He finds inspiration in nature, science,arts, life etc. There is a lot of attention for detail in his work. The techniques are quite similar as the techniques used by painters during the middleages, a timeperiod when attention to detail was important. The most important tools of trade are brushes for painting, pencils, ink and digital stuff. At this moment he is actively involved in collaborationprojects especially the Exquisite Corpse drawings. Ton is also very active in music. Playing different instruments like basguitar, guitar, synthesizers and doundouns[West African Percussion]. Currently he is a member of Barafoli and Dundunba Dordt and Drainair. Barafoli and Dunumba Dordt are specialised in West African music. Drainair is a project with Pascal Smeels. They use modern techniques to produce music in various styles. The Exquisite Corpse is a game invented by the surrealists in the first part of the 20th century. For example: One person makes half a drawing and covers it in such a way that only a small strip of the drawing is visible. The next person starts with that strip to complete the drawing, to uncover it only when the drawing is completed so that the final result will be a surprise. The book includes 103 artwork and several essays. Size 12¼ x 10 in / 31,5 x 25 cm, 112 color pages and hardcover, Printed in Europe. Marketing and distribution is through large book wholesalers and ecommerce channels, in US bookstores and eCommerce internationally including Barnes and Noble, Borders, and Amazon in USA, Amazon Canada, Amazon France, Amazon Germany, Amazon UK, Amazon Australia and others.